Senior Lieutenant Ivan Shevtsov, the future Hero of the Soviet Union, posing next to their destroyed the German “Tiger” heavy tank. The Battle of Kursk. The commander of a tank company of the 142 th Tank Battalion (95th Tank Brigade, 9th Tank Corps of the Central Front) Ivan A. Shevtsov in the July 15, 1943 at the head of his department and in cooperation with the infantry first rushed to the railway station Maloarkhangelsk (Oryol Oblast) and held it 4 hours before the arrival of reinforcements, causing considerable damage to the enemy in manpower and technology. 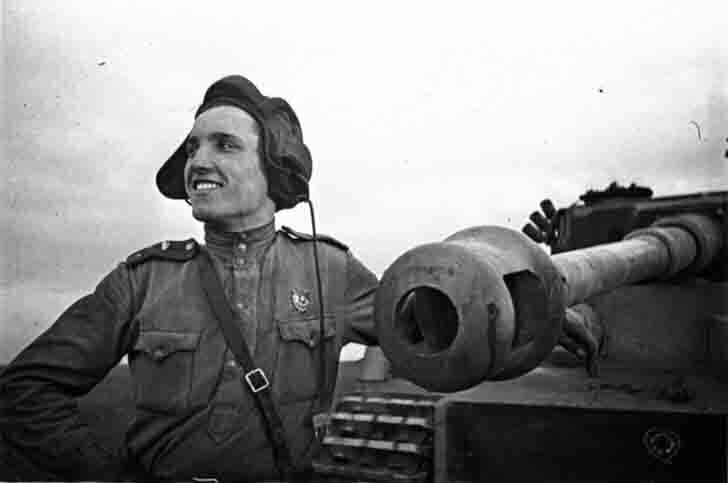 Tankman fighter Ivan Shevtsov personally destroyed three German medium and light tanks, one PzKpfw VI «Tiger” heavy tank and 3 anti-tank guns. For this fight in the August 27, 1943 tankman fighter Ivan Shevtsov, he received the title of Hero of the Soviet Union.